Alvin's PXB boards provide the convenience of a studio work surface in a compact, portable unit. 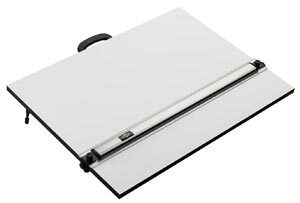 Each PXB is made from a smooth, warp-free white melamine laminated board and is equipped with a convenient carrying handle, non-slip tractor feet designed to grip the table edge at the perfect drawing angle, foldaway legs, and an acrylic straightedge whose height can accommodate material thicknesses up to 3 1/16". Shipped fully assembled. Alvin's PXB boards provide the convenience of a studio work surface in a compact, portable unit. Each PXB is made from a smooth, warp-free white melamine laminated board and is equipped with a convenient carrying handle, non-slip tractor feet designed to grip the table edge at the perfect drawing angle, foldaway legs, and an acrylic straightedge whose height can accommodate material thicknesses up to 3/16". Shipped fully assembled.